Meanwhile, the company he founded continues to be run by new CEO Lise Murphy, previously Wifarer’s VP of Marketing. Oh, and Lise is also Philip’s wife, so Wifarer sort of “remains in the family,” I’d guess you’d say. TechCrunch received tips hinting that Wifarer could be yet another indoor positioning acquisition for Apple, which is still trying to catch up to Google in this space. Apple, you may recall, notably acquired another indoor navigation startup, WiFiSlam, in March 2013 for $20 million. But as it turns out, Wifarer is not shutting down. At least not yet. In fact, promises Murphy, it is “poised to introduce some exciting new IPS [indoor positioning system] solutions for both iOS and Android. These new solutions will offer class leading levels of accuracy and consistency not previously seen in current IPS solutions,” she says. The company is also working to roll out new tools to its Android developers, which will simplify the adoption of IPS in existing iOS or Android applications, we’re told. Founded in 2010 in Victoria, B.C., Wifarer’s approach to indoor positioning was primarily centered on Android for many years, which sort of makes the CEO’s hire by Apple an odd one. The company’s iOS application only launched in December 2013, for example. The hire is additionally odd – versus, say, a complete acquisition of the small company – because Stanger’s background, which includes a bachelor’s degree from Johns Hopkins University and a Master’s degree from Yale University, is not (at least formally), technical in nature. Instead, he worked at places like Paramount Pictures and the BBC prior to Wifarer. And finally, it’s odd because despite new CEO Murphy’s claims, Wifarer could be seen as being in decline. The company got rid of its sales staff in 2012, and today there are roughly a half dozen employees still at the company, according to what we’ve heard, as well as public searches on LinkedIn. Murphy says its numbers are higher than that, but admits they’re less than Wifarer’s previous peak. “As the IPS market is maturing, we have been reorganizing for better positioning to prepare for our release of class leading new products,” she explains. The company didn’t respond to questions about fundraising challenges or customer traction and growth. However, we have heard that Philip had been shopping Wifarer around to a Wi-Fi base station manufacturer last year, and that deal fell through. Unlike with Apple’s prior acquisition target WiFiSlam, Wifarer is not a “core technology” provider in the indoor positioning space. Instead, it’s similar to what competitors Point Inside or Meridian were like back in the day. That is, those companies started with dedicated apps pitched to venue owners themselves. The challenge with that model is that business owners don’t generally want a white-labeled app to call their own – they have their own needs, of which location is just one part. 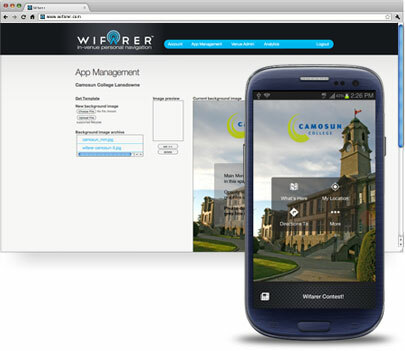 (Wifarer offers tools for venue owners, in addition to its consumer-facing apps). Meridian, for what it’s worth, shifted to offering an indoor map management system, which after a partnership with Cisco, helped them get acquired by Aruba for $26 million. Point Inside is also now more of a platform. And the only other notable exit last year was Singapore-based YFind to Ruckus Wireless for $6 million. Apple, of course, needs to beef up its indoor positioning core engine thanks to Google’s lead in this space – which is why it’s been recruiting and acquiring companies in this general space. In fact, the fact it even bought WiFiSlam hints at its challenges here. WiFiSlam’s technology helped Apple gain ground with a specific aspect in indoor positioning – the “matching” technology which helps to link a sniffed out Wi-Fi signal to a known location in an RF database. In the indoor positioning world, this is not really all that special. It’s the more basic part of IPS. The harder part is getting the database of RF signals in the first place. Possibly, Wifarer didn’t have any tech Apple wanted (its patents are still pending), the company didn’t want to sell, wanted to wait to see if its patents came through, or didn’t want to sell at the price Apple would have paid. After all, Apple is notorious for not overpaying for acquisitions, which is why it reportedly “lost” Nest to Google, for instance. It didn’t want to pay out something in the billions for Nest, after referencing its own sales channel data. Triple-digit millions, sure. Not billions. This, when there are barely a handful of engineers left?